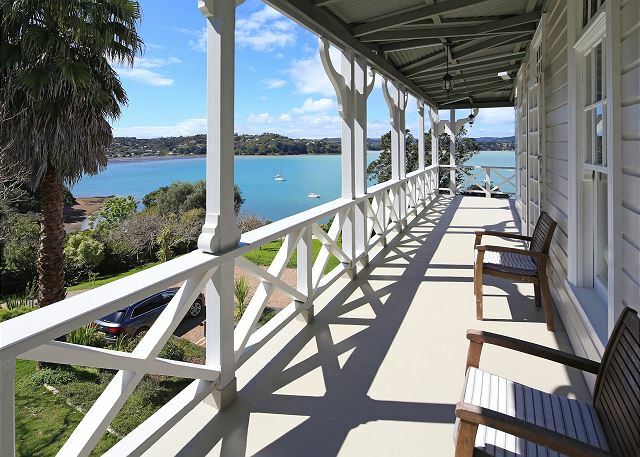 " What a delight Waiheke Escapes is to deal with and so helpful with Waiheke Contacts. 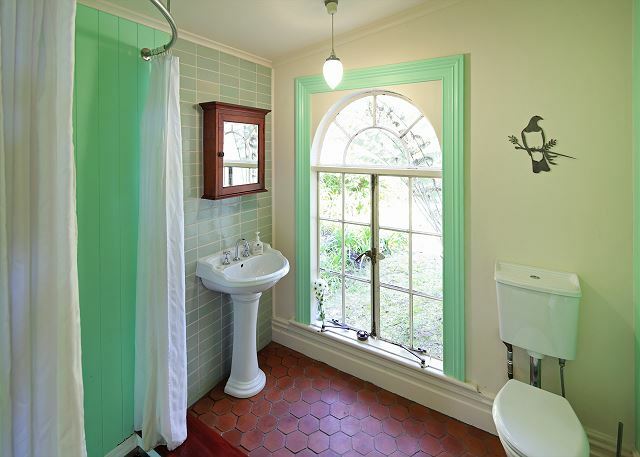 The house is better than the photos. Wow its beautifully furnished, fantastic location being right on the water edge. 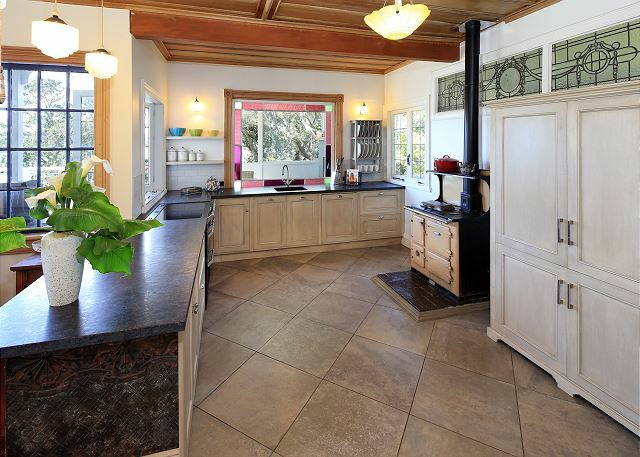 The kitchen is a dream and well equipped. Waiheke Escapes Accommodation Manager called in to check all was well. Loved the house, the worst part was leaving. Only downfall was the water pressure upstairs". 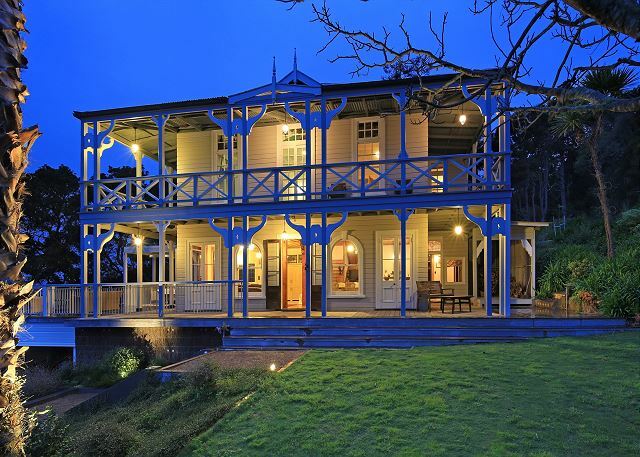 There are not enough words to describe how fantastic this property is. 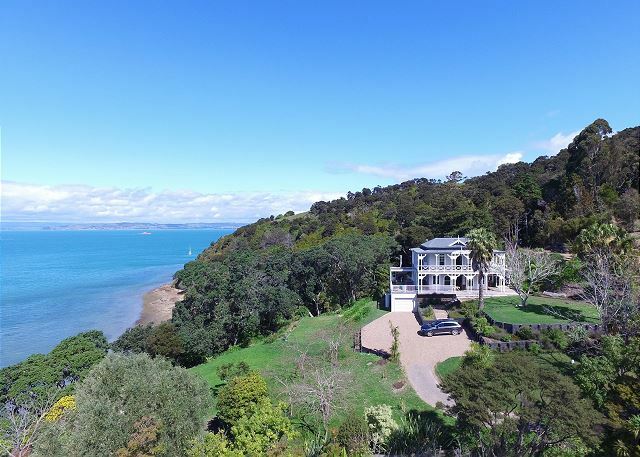 Totally hidden away from the rest of the world but still only 5 minutes in to Oneroa, with a private beach, a stunning kitchen with absolutely everything you could need, and then there are those fantastic indoor and outdoor entertaining areas. 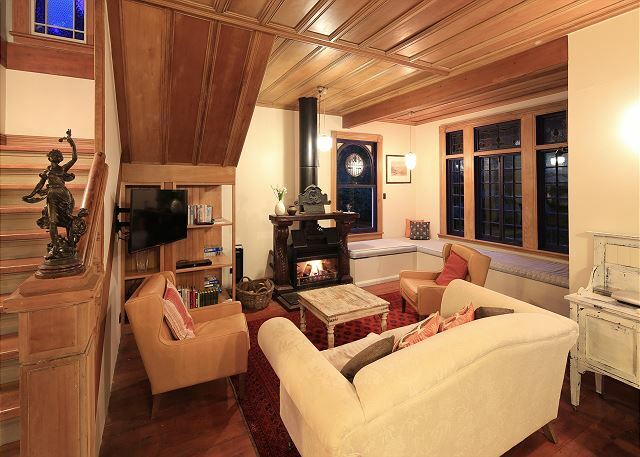 Top all this off with views from every window and fabulous indoor and outdoor fireplaces and you have our idea of heaven. 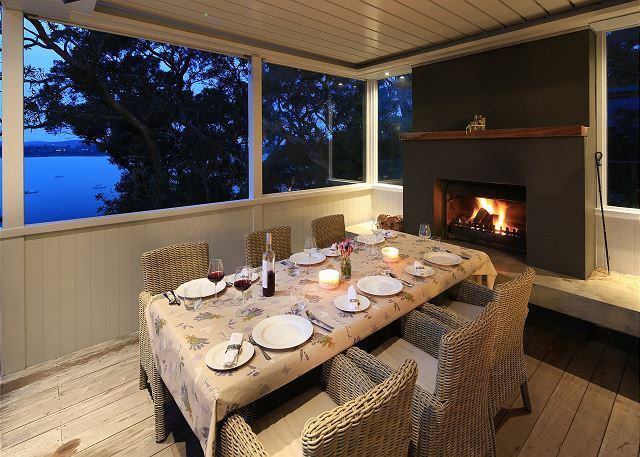 Thank you Waiheke Escapes, we can't wait to go back!! 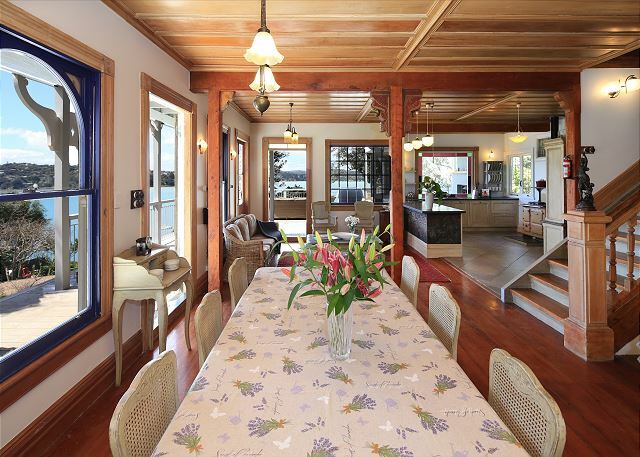 Located in the islands most exclusive suburb of Church Bay, only five minutes drive to the main hub of the island, Oneroa Village, this beautifully designed villa is perfect for an extended family or group. 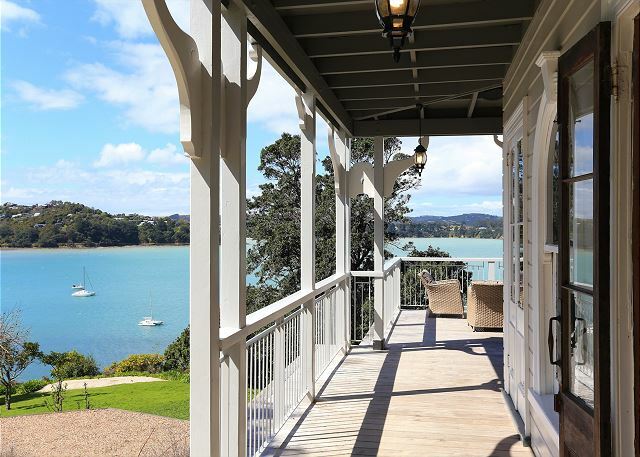 With a total floor plan of 230 square meters, this home offers the ultimate in space, style and location to ensure that guests have a truly one off experience in New Zealand’s award winning island wonderland. Bring your boat and tie up to one of the rent-able Mermaid Marine moorings available directly in front of the property and leave your dinghy on the private beach. 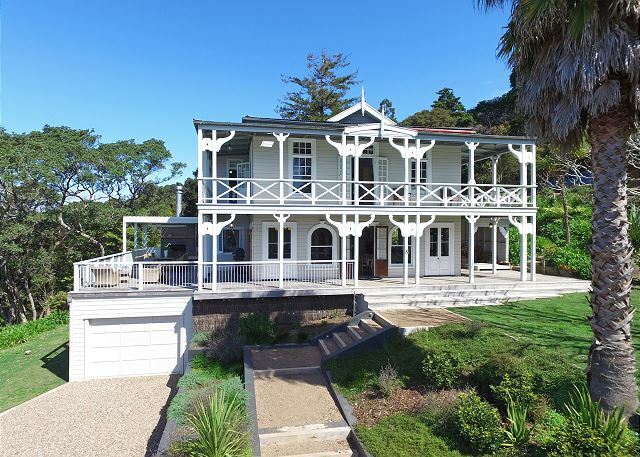 Two of the islands most popular vineyards Mudbrick and Cable Bay, are located on the same road just minutes away. Filled with beautiful original fittings from old properties previously located all around New Zealand, this one off property celebrates everything that is great about yesteryear while embracing today by including items like bose sound systems, a wonderful 900mm oven with an induction cooktop and flat screen television. 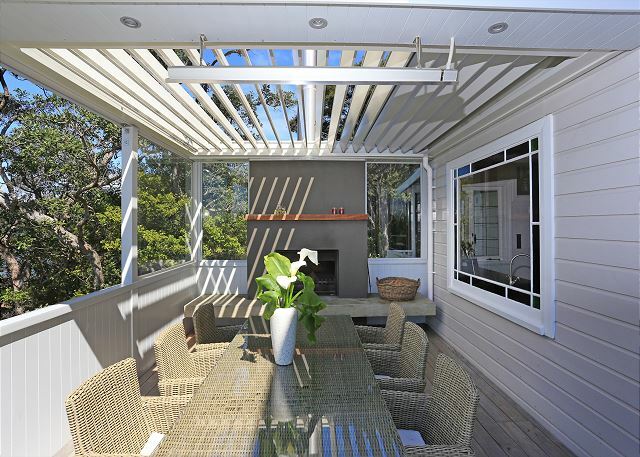 The kitchen is big enough to host four people in it at one time comfortably, and it opens out on to arguably, the most stunning outdoor dining area complete with a beautiful electric louver system and expansive views of Huruhi Bay. Fill the old wood burner stoves in the kitchen and the living room in winter and feel the warmth upstairs as it feeds through to the bedrooms. All four bedrooms are located on the top floor. 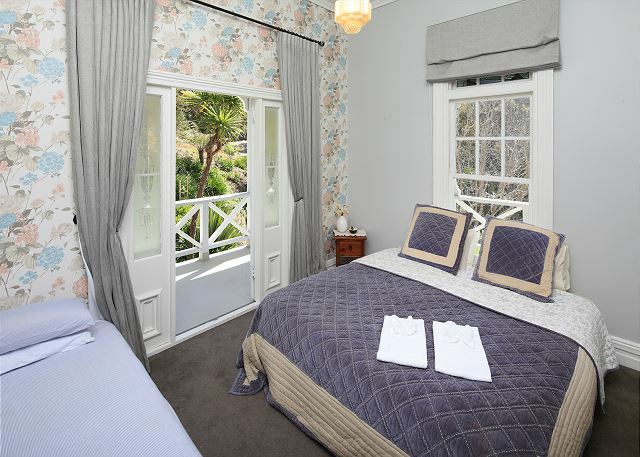 Each room opens out on to the verandah and to more views. The generous bedrooms have wonderful high ceilings and feature stunning ceiling roses dripping with original art deco light fitiings. The stunning light filled master bedroom with its glorious views, will have you wondering if you need ever leave the room. Beautiful gardens, a wonderful large grass area for children to play on, and a track directly to the beach below, and many wonderful walking options from 15 minutes to all day, will make this the property that you will want to come back to year after year. This property has dirt road access for part of the way off the main road and is steep in parts. You will require 4WD access during wet weather and we highly recommend a 4WD in general. These are readily available for hire on the island and Island Taxi\'s can provide a 4WD taxi should you not wish to hire a car. People mover vans that are not 4WD are not recommended as they are generally too light in the rear end for the ascent. An exit cleaning fee of $250 applies to each stay. 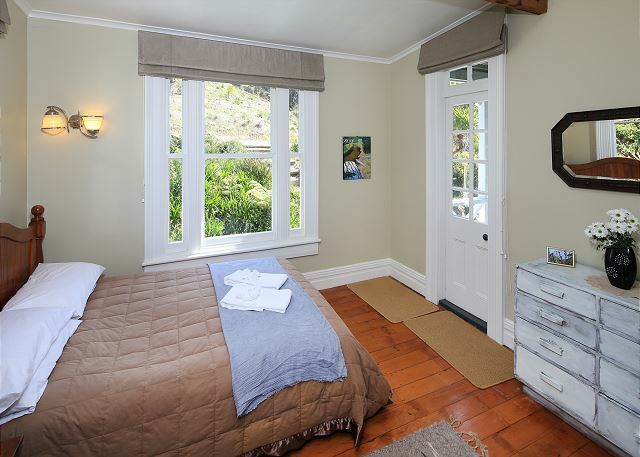 Minimum stays: 7 nights between late December and late January, 3 nights holiday weekends and 2 nights all other times. All linen is included. A late check out of 12PM applies to this property. This property is available for small conference groups during the Off Peak and Shoulder Seasons during weekdays only. This property is not available for weddings or parties.